Patrick, Week 1 - Time for a nice cup of tea? 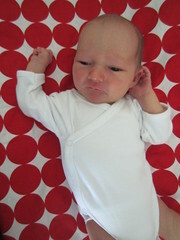 At one week, Patrick has been home from the hospital just 2 days and has settled in well. He feeds every 3 to 4 hours and wakes me up just twice at night :-) He took to breastfeeding like a champ and is putting on weight - midwife Oyen very happy. Favourite place to chill? In the hammock! Markus is fascinated by him, loves to watch his nappy being changed and will say "baby" before gently prodding him!